Prior to installing the networked LED system, NorthBay VacaValley Hospital’s exterior lighting consisted of 40 induction luminaires, 13 high-pressure sodium (HPS) luminaires, and 7 metal halide luminaires, all operating at full lighting power throughout the night. A total of 57 luminaires were installed with dimmable LED technology for the lighting demonstration. Motion sensors were installed to provide maximum coverage of the site, ensuring lights operate at sufficient levels when occupants are detected and use less energy when areas are vacant. An “ultra-smart” lighting control network was also put in place, giving facility managers the ability to adjust lighting schedules, light levels and time-out settings, monitor the system’s energy use, and receive automated alerts when luminaires require maintenance. UC Davis’s California Lighting Technology Center (CLTC) customized the lighting components to integrate them into a single, fully functional system and worked with hospital personnel to ensure system settings meet the site’s lighting needs. The retrofit reduced the site’s exterior lighting energy use by 66.4%, dramatically reduced lighting maintenance needs, and received positive reviews from about 88% of end-users surveyed for feedback. 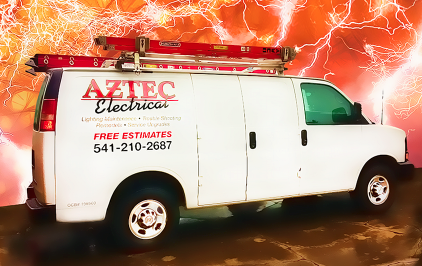 Call Aztec Electrical today at (541) 245-8560 to learn how our services can assist your project with new lighting technology. 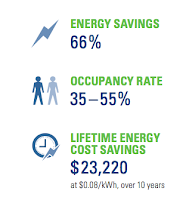 We can assist you with understanding the available rebates and incentives to improve your ROI.